Any individual entering a space environment who relies upon medication for the management of a medical condition would benefit from a profile of his or her individual drug metabolizing enzyme capacity. This is recommended in order to minimize adverse drug reactions when in the space environment and where medical attention will not be immediately available. This profile gives attention to two features: CYP450 SNPs and Phase II conjugating enzyme function. CYP 2D6 is also known as debrisoquine hydroxylase, which catalyzes the oxidation of approximately a quarter of all the commonly used therapeutic drugs in clinical practice today. For instance, Codeine is metabolized by CYP2D6 to morphine. In such cases, enhanced CYP2D6 activity (i.e., in CYP2D6 ultra-rapid metabolizers) predisposes one to opioid intoxication. CYP 2C19 (S-mephenytoin hydroxylase) acts on weakly or strongly basic drugs containing one hydrogen bond donor, or if there are functional groups containing carbon or sulfur, double bonded to oxygen present in the substrate. CYP 2C19 is responsible for the metabolism of anticonvulsant drugs, proton pump inhibitors, and drugs that inhibit platelet function. CYP3A4 is involved in the oxidation of the largest range of substrates of all the CYPs. It is the most abundantly expressed P450 in human liver and it is known to metabolize more than 120 different drugs. Examples of CYP3A4 Substrates relevant in human space flight include: acetaminophen, diazepam, erythromycin, lidocaine, lovastatin, and warfarin. CYP3A4 also is sensitive to enzyme induction, which tends to lower plasma concentrations of CYP3A4 substrates, resulting in reduced efficacy of the substrate. Some CYP450 genes are highly polymorphic, resulting in enzyme variants that may shape variance in drug-metabolizing capacities among individuals at Earth gravity (1G), let alone the microgravity environment. For context, it is estimated that genetics account for 20-95% of variability in drug disposition and effects. 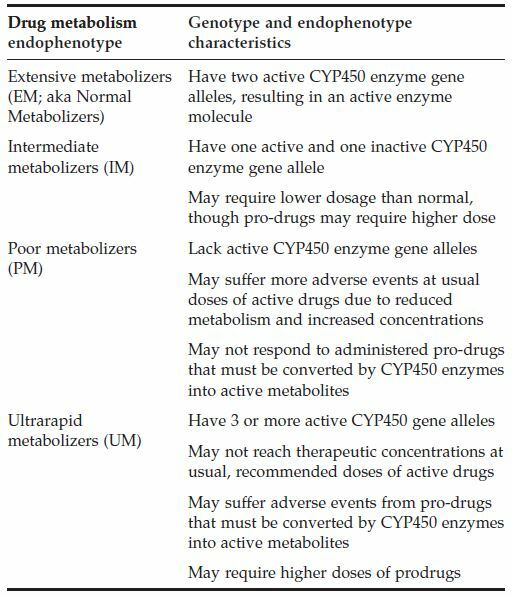 CYP450 metabolic capacities may be described as is shown in the Drug Metabolism Genotype and Endophenotype Characteristics table. For an individual on medication who is entering the space environment, it will be helpful to ensure that any medication ingested is compatible with his individual CYP450 profile. Where conflicts exist, alternative medications can be chosen that are metabolized via a different CYP pathway. While this approach is desirable for clinical care on Earth, it is even more essential in space. This is because we know little about how drug metabolism in space differs from that on Earth and there is more risk if an adverse drug reaction occurs far from medical care. For many drugs, metabolism via CYP450 is the first phase of drug biotransformation, as noted. These same drugs frequently pass through a Phase II biotransformation reaction. Phase II drug metabolism reactions are generally characterized as conjugation reactions, wherein a small molecule is bound to the drug metabolite to improve solubility for eventual excretion. Characterization of space participant Phase II profile might consider at least three features. These are: 1) SNP variant profiles of Phase II conjugation enzymes, 2) adequacy of micronutrient cofactors of Phase II enzymes, and 3) adequacy of conjugation agents that directly bind drugs, as part of Phase II conjugation. 1) SNP Variant Profiles of Phase II Conjugation Enzymes. For instance, UGT (UDP glucuronosyltransferases) is an enzymatic superfamily, which is involved in conjugation of endogenous compounds (bilirubin, steroidal hormones, thyroid hormones, biliary acids, vitamins) and exogenous compounds (drugs, carcinogens, and polluting dietary elements) that are transformed in N-, O-, S-, C- glucuronates. They are responsible for roughly 35% of Phase II reactions. Understanding genetic variants of Phase II enzymes will be helpful in designing individualized drug regimens. 2) Adequacy of Nutrient Cofactors of Phase II Enzymes (e.g. riboflavin as cofactor for glutathione-S-transferase and glutathione reductase): Assess pre-flight status of all nutrient cofactors of drug biotransformation, using serum, plasma, or cells (RBC, WBC) to ensure optimum status for each individual astronaut. If warranted by genotype, provide nutrient cofactor at dosage commensurate with the allelic variant (e.g. wild type, heterozygote, homozygote). 3) Conjugation Agents that Directly Bind Drugs, as Part of Phase II Conjugation: Assess pre-flight status of key conjugation agents (e.g. glutathione, glycine, cysteine, glutamine, arginine, taurine, acetate) to ensure optimum status for that individual. This can be done by plasma amino acid profiles or, in the case of glutathione, white blood cells or whole blood. For example, in most cases of glutathione conjugation, more polar glutathione conjugates are eliminated into the bile or are subsequently subjected to other metabolic steps. This eventually leads to formation of mercapturic acids, which are excreted in urine. This process depletes glutathione stores, as GSH binds drugs through the conjugation of Phase I intermediate metabolites. This depletion can limit the amount of glutathione available for future drug metabolism reactions and, also, alter the REDOX balance of the cell. For instance, the analgesic acetaminophen is converted to the electrophilic N-acetyl-p-benzoquinone imine (NAPQI), which is conjugated for removal by glutathione. If glutathione is in poor supply, NAPQI exerts highly toxic effects by covalent reactions with proteins, such as those found in mitochondria. This can lead to liver damage. If glutathione depletion is identified through blood chemistry (low GSH or low GSH:GSSG ratio), pre-mission glutathione or glutathione precursors can be provided at the dosage needed to assure optimum mission status. Stable glutathione precursors, such as N-acetylcysteine, can be provided on missions. Research: Our research collaborations support investigator teams working to study the application of pharmacogenomics and pharmacometabolomics in spaceflight research. Clinical: Our clinical support can assist spaceflight medical directors, flight providers, spaceflight participants, and other associated with spaceflight to profile and assess individual and team pharmacogenomic profiles, as part of countermeasure development with the goal of optimizing mission safety. Training associated with our Spaceflight First Responder and Spaceflight Advanced Life Support programs. These incorporate concepts of pharmacogenomics, as pre-mission logistical considerations aimed at optimizing the space flight experience and limiting adverse events. Schmidt, MA, Schmidt, CM, Goodwin, TJ (2019) Pharmacogenomics in Spaceflight: A Foundation of Personalized Medicine in Astronauts.